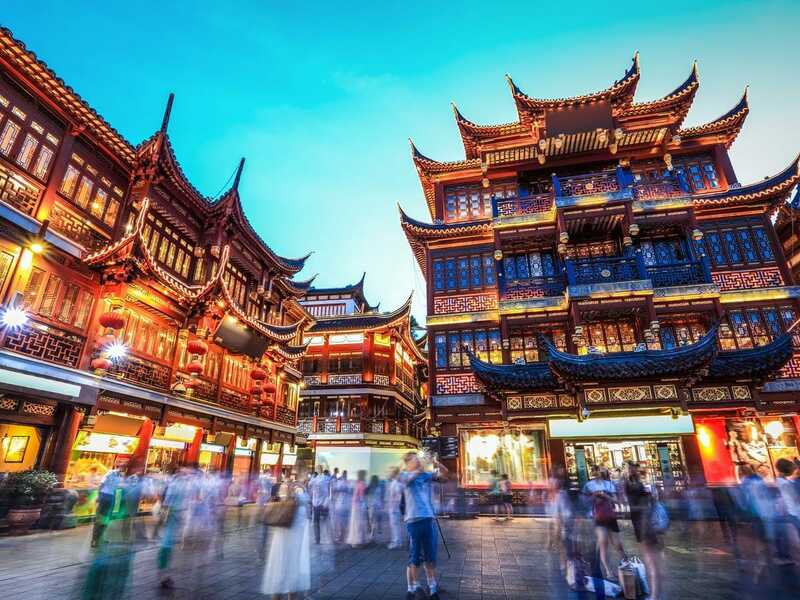 Discover the beauty of China’s rich culture, ancient history, delicate cuisine & modern architecture with this 10-night tour of China that includes your return international flights, 10 breakfasts, 7 lunches & 1 dinner. This once in a lifetime bucket list experience will see you walking the iconic Great Wall of China, exploring the majestic Summer Palace, observing the silent vigil of the Terracotta Army, discovering the picture-perfect West Lake in Hangzhou, indulging in the hustle & bustle of Shanghai & much, much more! Enjoy return full-service international flights, with luggage, taxes and fuel charges included in the price. All flights provided are on a full-service Chinese carrier. Click the Finer Details tab for more information. Fly from other cities from $300*pp. Feast on a range of delicious meals when you pull up a seat for breakfast at the restaurants of each hotel. Expect all your favourites, plus a range of delicacies you may never have tried. 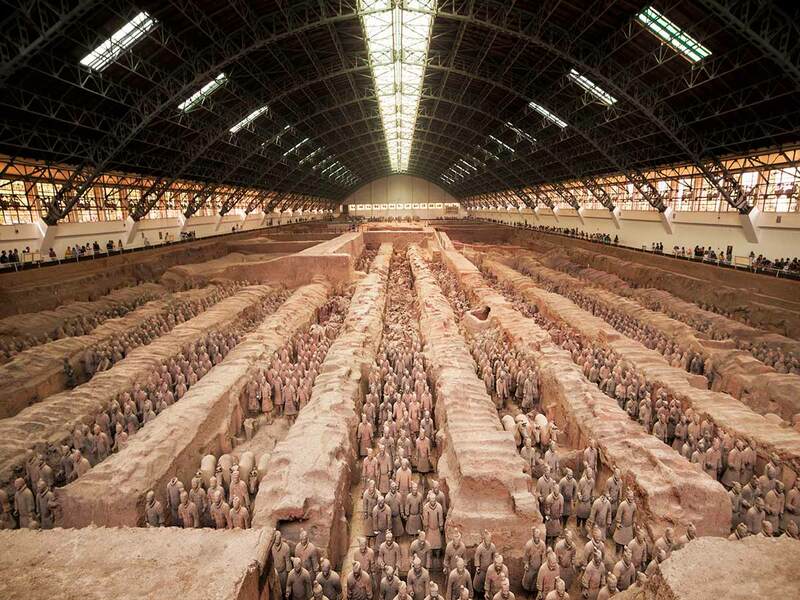 Getting from Xi’an to Beijing is easy with us. We’ve made all of your arrangements, so you can sit back and enjoy the flight. Race to Suzhou on-board a high-speed bullet train or take advantage of an internal flight to Shanghai. The last thing you want to do on your holiday is stress about how you’re going to get to and from the airport & hotels. With us, you won’t have to worry. Enjoy return airport & hotel transfers on us. Get around China in total comfort. Enjoy air-conditioned coach transportation (20kg per person luggage limit) when travelling between Wuxi, Suzhou, Hangzhou and Shanghai during your 10 Night China tour. Savour the beauty of China. Walk along the incredible Great Wall, stroll through the exquisite Chinese Gardens in Suzhou plus heaps more. Don’t miss out on a thing. Your tour includes English-speaking tour guide(s) throughout your 10-night tour of China. Fly to Xi’an via connecting cities and transfer to the hotel. After breakfast, visit the Shaanxi Provincial History Museum. Enjoy a special noodle lunch including an interesting noodle making demonstration. Then visit the Great Wild Goose Pagoda, the symbol of the city. Later, walk along the Ancient City Wall, which is not only the most complete city wall to survive in China, but also one of the largest ancient military defence systems in the world. Fly to Beijing & transfer to hotel. After breakfast, visit Tiananmen Square in the centre of Beijing. The square is named after the Tiananmen (Gate of Heavenly Peace) located to its north, which provides entry to the famed Forbidden City. The square contains the Monument to the People’s Heroes, Great Hall of the People, National Museum of China, and the Mausoleum of Chairman Mao Zedong. You may also wish to take an optional Forbidden City Tour (at your own expense). You’ll discover the former seat of the emperors throughout the Ming and Qing dynasties. It is a true architectural masterpiece and is home to the fascinating National Palace Museum. Peking Duck Lunch ($50 per person): Dine on Peking Duck. Forbidden City Tour ($85 per person): Explore the ancient and imposing heart of China’s imperial past. 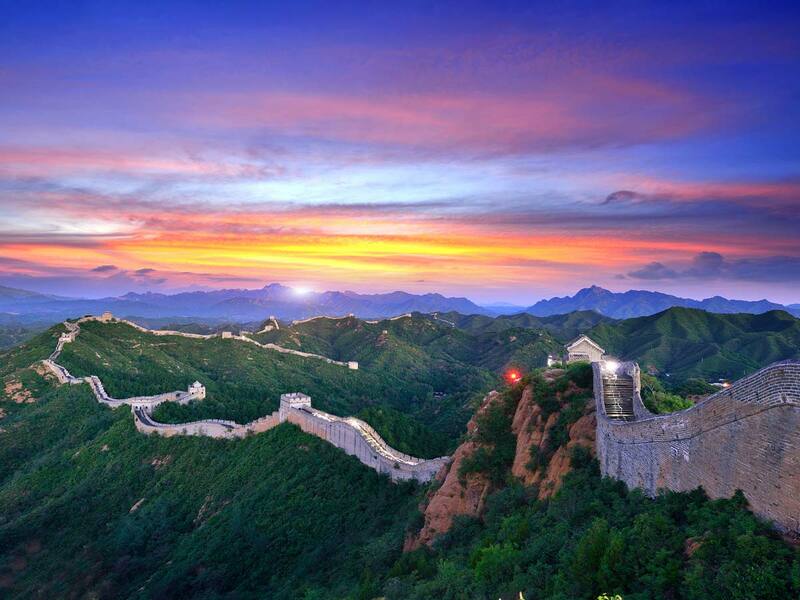 Today’s highlight is an excursion to the majestic Great Wall, one of the Seven Wonders of the World. You’ll have a chance to climb a portion of this 6,000km marvel, at Juyong Pass. 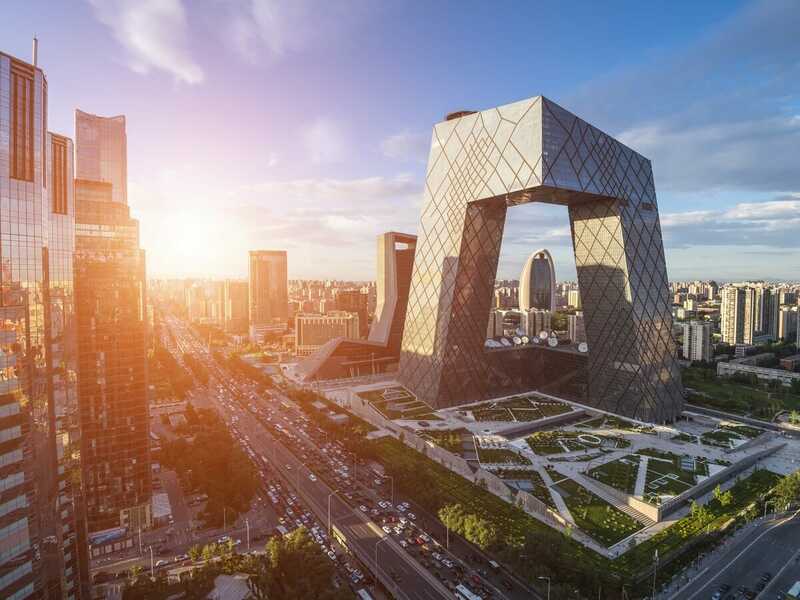 Then tour the iconic Beijing 2008 Olympic Centre; which includes the famous Bird’s Nest and Water Cube stadiums, which now host many spectacular events. You’ll see these magnificent structures from the outside, providing a perfect photo opportunity. You’ll visit one of the largest jade exhibitions in Asia en route, and after lunch, see skilled artisans work at a cloisonné factory. The Golden Mask Dynasty ($75 per person): Be amazed by the colour, music, and action of this large-scale stage production (evening). 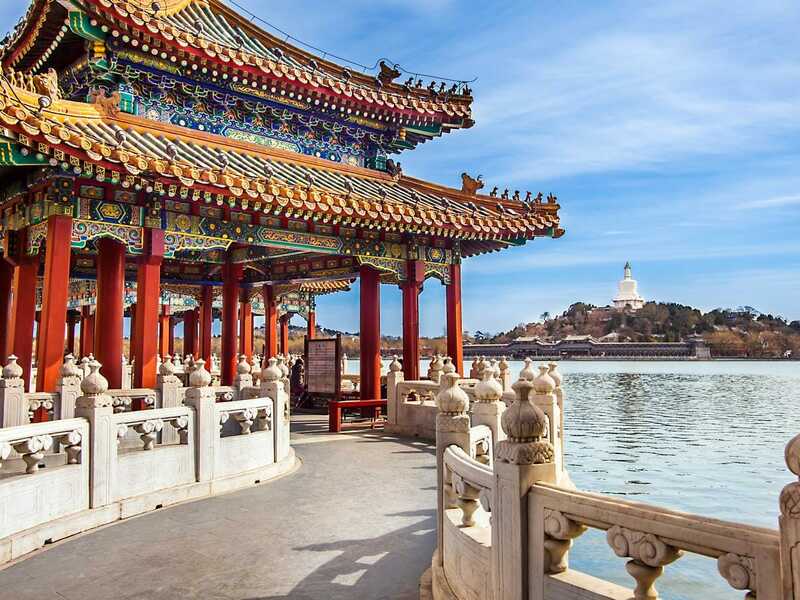 Today, tour the exquisite Summer Palace, the largest preserved ancient garden in China, and formerly a summer resort for emperors. This is followed by a visit to a Chinese herbal medicine institute and learn about this ancient medical tradition. Then, take a high-speed train to Suzhou. Alternatively, the group may fly to Shanghai and travel the short distance to Suzhou by bus. Note: The mode of transport (flight or train) will be confirmed by the time final documentation is ready hence within 2 weeks prior to departure. 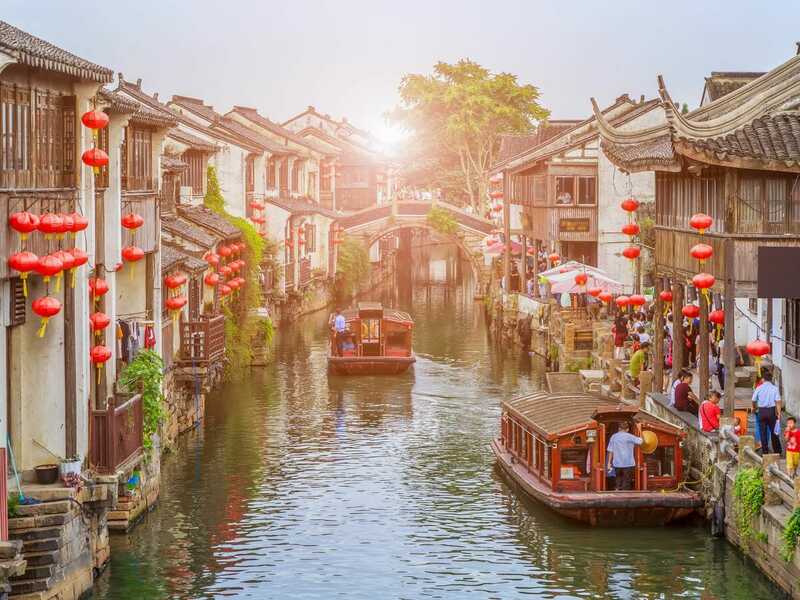 Suzhou has long been known as the ‘Venice of the East’, for its exquisite canals, bridges, pagodas, and beautiful gardens, and is a designated UNESCO World Heritage Site. After breakfast, tour the Lingering Garden, a classic private garden with 500 years of history. Next, visit the largest silk factory in the country, and discover how silk is manufactured from mulberry-munching silkworms. You may also take an optional cruise along the Grand Canal (at your own expense) and view life along this section of the longest and oldest canal in the world. Late afternoon, we continue to Wuxi and visit Three Kingdoms City, which is a major CCTV (China Central Television) production studio, and a renowned tourist attraction. The Romance of the Three Kingdoms, a historical TV series, was filmed there. Grand Canal Cruise ($45 per person): Cruise on China’s Grand Canal, at 1,776km long and reaching all the way to Beijing, this massive engineering feat was unparalleled in the ancient world. This morning, tour beautiful Li Lake (Lihu), which is the most scenic corner of Wuxi’s huge Lake Tai (Taihu), followed by a visit to a freshwater pearl exhibition and store. Continue on to Hangzhou, described by Marco Polo as “the most beautiful and magnificent city in the world”. 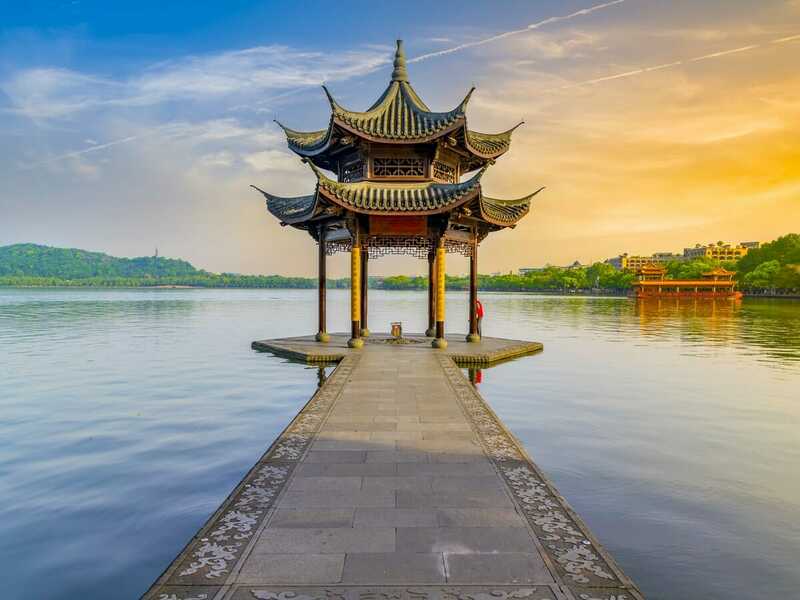 Upon arrival, you may take an optional cruise on the serene West Lake (Xihu), which the most renowned feature of Hangzhou, and is noted for its scenic beauty, which blends naturally with many famous historical and cultural sites. In the evening, you may wish to attend Enduring Memories of Hangzhou, and see the story of West Lake come alive before your eyes. West Lake Cruise ($55 per person): An optional cruise on the serene West Lake. Experience tea-tasting at the Dragon Well Tea Plantation, which produces some of the the best ‘Longjing’ Green Tea in China. After lunch we drive to Shanghai. The Bund, on the Huangpu River and lined by historical architecture of European design, is the best place to capture the Westin influences of the colonial era. Then, visit the City God Temple Bazaar, which is composed of stores selling traditional Chinese arts and crafts, medicine, and souvenirs. Tonight, you can watch a thrilling Chinese acrobatic show SPIRAL (at your own expense). SPIRAL Acrobatic Show ($85 per person): A thrilling Chinese acrobatic show, featuring dance, drama, music, and multimedia effects. In the morning, tour Shanghai Museum, to see ancient Chinese art, furniture, and jade, followed by a visit to an emerald exhibition centre. In the afternoon, you may enjoy an optional half day tour of the Jin Mao Tower and Xintiandi ($85 per person). You’ll visit the Jin Mao Tower Observation Deck on the 88th floor, for a panoramic view of the Huangpu River and the Bund. Xintiandi (New Heaven and Earth) holds the historical and cultural legacy of the city. It was the site of the first congress of the Chinese Communist Party but is now the most expensive place to live in China. Tonight, you may enjoy an optional Huangpu River cruise. Half-day City Tour ($85 per person): Tour the Jin Mao Tower and see the city from the 88-floor observation deck, then visit the famed Xintiandi district. 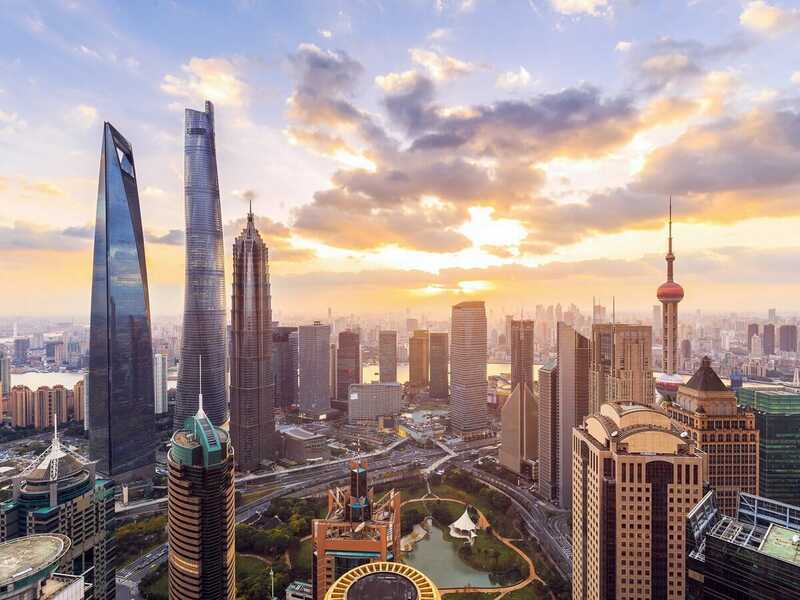 Huangpu River cruise ($75 per person): Get a glimpse of the dazzling view of Shanghai, with the colonial-era Bund on one side and the futuristic skyscrapers of Lujiazui financial district on the other. Optional programs available (prepaid in Australia 2 months prior to departure or pay in local currency while on tour). Note: Customers may choose to book and pay for the optional programs to the guide on the tour. Note: Several shopping stops are included as cultural learning experiences with no obligation to purchase local specialty products. Interstate surcharge: Brisbane $100 per person. Adelaide/Perth $300pp (flights may be via Sydney or Melbourne) Tour provider to collect additional funds. Nexus Holidays will collect the final payment from the customer 120 days prior to departure. The original deposit is non-refundable unless approved by both Nexus & Ignite Travel. All documentation will be emailed to the customer within 2 weeks prior to departure. The 2020 itinerary is subject to change and there may be minor adjustments to this. All prices are per person twin-share unless otherwise stated and subject to revision without notice. Itineraries, airlines, hotels and ships are subject to availability and change. Nexus Holidays reserves the right to provide substitutes of similar quality and adjust the itinerary as we see fit to ensure smooth operations. Passengers must remain with the group at all times. Fees may apply for deviations from the set itinerary. Total length of trip includes time spent in flight and it subject to flight schedule. Flights are not available until approximately two weeks before departure and may involve up to two transits per leg. Please check all information before booking. By booking you accept all booking conditions. After purchasing vouchers customers will be contacted within 72 hours by our booking partner Nexus Holidays who will forward a booking form to confirm dates, where any additional extras will need to be paid for to Nexus Holidays.